A couple of generations have passed by, since then, and now it is being observed that Freud did give the most compact and appropriate answer. At present, we do indeed devote most of our time and energy to matters of the heart and the mind; most of our joys and sorrows concern our relationships and career. 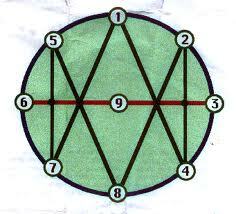 The Enneagram describes the nine different ways of relating in intimacy and business. The nine personalities are part of a human development model called the ‘Enneagram’. The term has been derived from a Greek word Ennea which means ‘nine’ and gram which means ‘model’. The Perfectionist : They feel the world is an imperfect place. I work towards perfection. a. Avoiding errors and evils and searching for perfection. f. Compulsive work load can block out unacceptable feelings. g. Unwanted anger caused by unmet needs. h. Worry in decision making. 2. The Giver : For them, people in the world need my help. I am needed. a. Avoid own needs and help others. Thus gaining approval. b. Pride in being indispensable. c. A sense of having different selves to serve the purposes. d. Hard to recognize own needs. e. Confusion arises between the different personalities. 3. The Performer : For them, the world values champion. I must avoid failure. a. Achievement, productiveness and performance. c. Poor access to emotional life. e. Chameleon i.e. changing roles and images. 4. The Romantic : For them, something is missing. Others have it. I have been abandoned. b. Mood, manners, luxury hedge low self esteem. c. Attracted to the mood of melancholy. e. Wanting the best of what is missing. f. Emotional sensitivity and depth. 5. The Observer : They feel the world is invasive. I need privacy to think and refuel my energies. d. The power of knowing. e. Confusing spiritual non attachment. 6. The Trooper : They feel the world is a threatening place. I question authority. c. Anxiety peaks with success. h. Afraid to recognize own anger. j. Identifying with underdog causes. 7. The Epicure : They feel the world is full of opportunities and options. I look forward to the future. c. Replacing deep or painful feelings. d. Charm as the first line of defense. 8. The Boss : They feel the world is an unjust place. I defend the innocent. a. Controlling possessions and personal space. b. Concerned about unjust and power. e. Difficulty in recognizing dependency. f. Denying other’s point of view. 9. The Mediator : They feel the world won’t value my efforts. Stay comfortable. Maintain the peace. a. Replacing essential needs with unessential needs. b. Confronting self with unessential pleasures. c. Ambivalence about personal decisions. d. Postponing change by repeating familiar situations. e. Hard to initiate changes. g. Dampening physical anger and energy. Try this free online personality test and understand yourself better. Know how you think and what matters to you most by taking this personality quiz now!